Diving in Monterey Bay area was fantastic. I rented tanks & weights, got fills and hired a local dive guide from the Monterey Bay Dive Center (MBDC.com) across the San Carlos Beach Park. DMs Chris and Tamin, and owner Jim Field are great local guides. The plan was to do 2 dives on Saturday and Sunday. I ended up staying an extra day to dive at Point Lobos on Monday and doing a total of 8 dives over 3 days. Point Lobos is booked months in advance, so early planning is necessary (not my strength) to be able to dive this site on weekend. On Saturday, I was paired with Gerald, a diver from the UK. Chris was our guide and Tamin tagged along with Jim. Our first dive was towards the Metridum field. We followed a large pipe towards the middle of the bay. We had low visibility (5-8 feet). We saw some marine life, lots of sea stars, kelp, anemone and a few fish. There were a huge number of brown (sea nettle) jellyfish (6-8in diameter, 12-18in tentacles) when we hit 30ft, it was hard not to get in contact with them. We had to swim very close to the bottom, under them no to get sting... When we arrived at the Metridum field, the visibility was bad and we lost Gerald for a couple of minutes. After we found him, we called the dive and we got separated from Chris on the return, but made it safely to shore as Jim was just behind us. Our second dive was on the Breakwater wall. The visibility was better (10-12 feet), but not so great. Gerald aborted his dive (actually shot at the surface) due to a buoyancy problem. Chris came to his rescue so I could continued my dive with Jim, the owner of the shop. After lunch, I decided to dive the Breakwater wall again, but this time in solo to go at my own pace and take the time to observe the marine life. Now instead of a 40 min dive, I did a 70 minute dive. On Sunday, I met Gerald at the shop and we had 2 additional divers. They had not dived for 3 years and I was offered to dive with Tamin instead of with the group so we could stay down longer and go further out taking the time to visit the Metridium Giganteum field. Reached there in 10-15 minutes and enjoyed the field for a little while. Visibility was better than Saturday, but not so great either. On the way back, got to dive deeply in the kelps between the hidden beach and San Carlos beach; it was a lot of fun.... For the second dive, Chris came with us since the 3 other divers had bailed out on him after their first dive - too rough and low viz. We started from the hidden beach with the plan to head South East when we hit 40 feet. We ended up far off in front of San Carlos beach and got separated from Chris as I got busy looking at an anemone that had just caught a fish and closed itself completely.... surfaced to look for Chris and after a few minutes, descended and headed back towards shore. That was fun, but not as planned.... After lunch, I went solo again to the Breakwater Wall for my third dive. That was my best dive of the weekend at San Carlos Beach. I saw many kinds of nudibranchs, got to swim/play with a harbor seal (had big eyes and fast; may have been a sea lion, I was too excited to notice if he had ears of not...), there were so many different kind of invertebrates (sea stars, cucumbers, jellyfish, etc.) and the best visibility of the weekend so far. Upon my return and after some discussion with Jim and Chris, I convinced them to bring me to Point Lobos early Monday morning so I could dive the kelp forest. On Monday, we met at 7:30 at the shop to pick up tanks and headed towards Carmel. Point Lobos is a gorgeous wildlife reserve at the ocean’s edge. Historic Whaler’s Cove is the entry zone. There were about 20 harbor seals swimming and looking at us while we setup our dive gear. The seas were a little rough comparatively to San Carlos beach, but not too bad as long as you don’t get too close to the cliff. For the first dive, we went around the Cannery Point Wall and Cannery Pinnacle towards the Bluefish Cove. Fantastic dive! We hit 90+ feet for a 50 minute dive. The marine life was amazing. After swimming there, I understand why it is called the Kelp Forest... It was so fun to dive with the seals, fish, anemones, corals, sea stars and nudibranchs. Never seen so much marine life. It was simply magical. The kelps were like trees extending for 70-80 feet to the sky, forming like the ceiling of a cathedral. The schools of fish were like birds flying in the forest. The sea floor was so colorful it was amazing... For the second dive, we cut across the Cannery Point Wall and headed directly to the Bluefish Cove. It was fun to dive in the middle of the thick kelp forest with the surges, 40 ft forward, 15 ft backward... Again the marine life was fantastic. I would venture to say that my first dive at Point Lobos, with 80+ ft visibility and 50F water was probably my favorite dive ever. It was amazing to see all the marine life at the bottom; the fish were like birds in the kelp forest and I was suspended right in the middle in amazement. 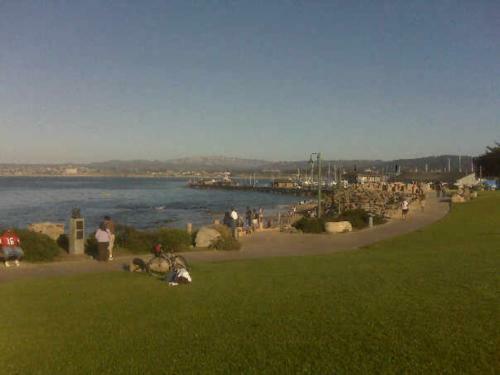 I used to go jogging along that path in the picture down to Lover’s Point in Pacific Grove. Loved it! I didn’t get to dive too much while I was living there due to time and expenses (Army pay doesn’t go far). Sorry the viz wasn’t so good for you on the first day. The viz is kind of hit & miss at San Carlos. But if you can get 10-15, that’s good enuff for check out life on the jetty wall. Lots to see up and down the wall if you slow down and take the time to look. (a lot of people don’t) Great photo ops along that wall. :) Great plan to head to Pt. Lobos. Glad you didn’t miss that. Beautiful place to dive & just hang out and watch the waves.